floatingsheep: What percentage of edits to English-language Wikipedia articles are from local people? For more on the method that we employed, have a read through the post on "who edits Wikipedia" - in which the data collection efforts have been explained in much detail. The data are undoubtedly somewhat imprecise, but we are confident that they offer us the best overview of the geography of authorship that can be obtained with publicly-available data. Unsurprisingly, they show that in predominantly English-speaking countries most edits tend to be local. That is, we see that most Wikipedia articles (85%) about the US tend to be written from America, and most articles about the UK are likewise written from the UK (78%). The Philippines (68%) and India (65%) score well in this regard, likely because of role that English plays as an official language in both countries. But why then do we see relatively low numbers is other countries that also have English as an official language, such as Nigeria (16%) or Kenya (9%)? We also, interestingly, see relatively high local edit percentages from a handful of countries that don't count English as an official language: Finland (50%), Norway (56%), Romania (54%), and Bulgaria (53%). Then we also observe large parts of the world in which very few English-language descriptions about local places are created about local people. Almost all of Sub-Saharan Africa falls into this category. The key question is whether these data actually tell us anything meaningful. For instance, just because most edits about the United States likely come from the United States does not necessarily mean that those articles are representative, include a diversity of viewpoints, or fail to exclude people, places, and processes. But the data nonetheless, in a very broad way, do tell a story about voice and representation. 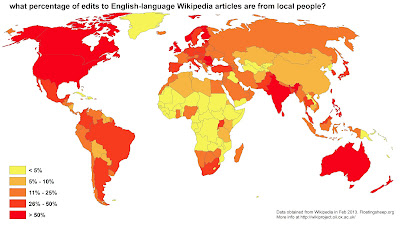 Some parts of the world are represented on one of the world's most-used websites predominantly by local people, while others are almost exclusively created by foreigners, something to bear in mind next time you read a Wikipedia article. Interesting. Why though use the English wikipedia as standard of voice and representation? The Web Index (thewebindex.org) in trying to put a finger on positive impact of the web, includes the number of wikipedia articles in local language. comparing with Etholog data. That's an excellent point. What percentage of edits in Spanish wiki are from South America or Spain? I'm willing to bet most contributions to Portuguese wikipedia are from Portugal. Judging by the kind of nationalistic fights I've seen played out in articles relating to countries as varied as Poland, Russian, Armenia, Turkey and Argentina I am glad 3rd parties with less skin in the game are making contributions because it reduces my chance of reading false agitprop.